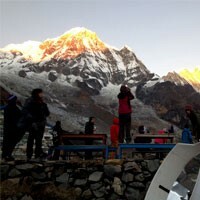 This 17 days Manaslu circuit trek itinerary is Normal itinerary. We make customize Manaslu circuit trek, Tsum Valley Manaslu circuit combined trek, Manaslu circuit Annapurna circuit trek, and Tsum valley Manaslu Annapurna circuit trek according to your time, budget, and interest. Our representatives will be awaiting your arrival at Tribhuvan International Airport from where you will be taken directly to your hotel. After refreshments, you will be introduced to the guides and other members of the company after which you are free to travel around the city indulging in the local delicacies, sights and sounds. Overnight stay at a hotel in Kathmandu. Day 02 : Kathmandu city tour and trek preparation. Today, we journey to witness the spellbinding locations around the valley. The tour begins with the Buddhist heritage at Swayambhunath overlooking the Kathmandu valley from the top of the hill before heading towards the Hindu temple of Pashupatinath often referred to guardian god of the nation. Deviating from the religious heritage we head towards the historical sights of Kathmandu Durbar Square. The tour ends at Boudhanath with calming views of the sunset. Overnight stay at a hotel in Kathmandu. The Manaslu Circuit Trek begins as we make our way out of the valley through its windy twisty roads towards the mesmerizing views waiting at Soti Khola, Gorkha. Heading out of Kathmandu, we soon find ourselves in midst of a comfortable ride through the Prithvi Highway. The thrashing Trishuli River soon joins us adding beauty to the landscapes which in its own right is captivating. Crossing the town of Arughat we bring the ride to a close reaching Soti Khola. Overnight stay at Soti Khola. We begin the day by crossing a bridge over Soti Khola heading towards the Sal forests on the opposite end. Accompanied by Budhi Gandaki thundering beneath, we continue on the Manaslu Circuit trekking which soon gives way to the village of Khursane and Lapubesi. The valley opens in front of us as we make our way through well-built stone tracks to reach Machha Khola over the bridge and toward the village. Overnight stay at Machhakhola. Today, we head towards the picturesque city of Jagat making our way through the gorge up the river. The trail winds up and down through the hilly landscape crossing Tharo Khola and heading to Khorlabesi. From Khorlabesi, we make our way to Tatopani where a warm and relaxing hot water baths await us. The trail in the Manaslu Circuit Trek map follows the Budhi Gandaki River and crosses path with it on multiple occasions to reach Jagat. Overnight stay at Jagat. Today, we trek to the hilly village of Deng and the trail is brightened by the stunning landscapes, dense sub-tropical forests and small rivers. The trail climbs onto a rocky ridge heading to Salleri continuing to Ghatta Khola crossing Sirdibas. Chasing the trail through fairly levelled millet fields and pathways we reach Ekle Bhatti and head along Budhi Gandaki River before finally settling down at Deng. Overnight stay at Deng. The trail begins with a crossing over Budhi Gandaki River our constant companion for the past few days to reach the hamlet of Bihi. We also enter the Manaslu Conservation Area today and the forested trail filled with exquisite floras and faunas provides a testament to the captivating beauty the region boasts of. We head to Prok enjoying the mesmerizing views of Serang Himal (7,161m) up and over the forests landing at the base of the hill leading to Namrung. This day is guided by the majestic Ganesh Himal (7,422m) and Himalchuli (7,863m) looming on the back ground as we head towards the quaint hamlet of Lihi crossing several small passes and patches of lush green forests. The trail winds down to Lho through seas of prayer flags and stone cairns continuing to Shyala. We get our first peek at the majestic Manaslu Himal (8,163m) as the journey ends at Samagaon. Overnight stay at Samagaon. The journey begins on a rocky trail heading past stone cairns and rocky ridges towards the towering Himalayas on the distance. 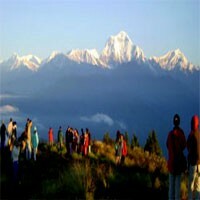 The paths are often travelled by pilgrims singing their traditional songs and also by trekkers seeking to acclimatize. The gompa itself belongs to the older generation home to Buddhist artefacts, teachings and is blessed with captivating views of Mt. Manaslu (8,163m) and Ngadi Chuli (7,871m). We descend back to Samagaon for the night. One of the easy days of the Manaslu Circuit Trek, we make our way to Samdo today. The journey begins with a steep descend towards the thrashing Budhi Gandaki before making its way towards the ever-widening valley. Guided by the stunning mountain vistas, the trail dives deep into alpine forests before clearing at Kermo Kharka. The trail once again dwindles to the familiar Budhi Gandaki beyond which the rugged trail leads to Samdo. Overnight stay at Samdo. Today, we trek to Dharmasala which also houses the base camp for Larkya La Pass. The journey out of Samdo heads towards the Larkya Bazaar a famous Tibetan trading place in the ancient times. Once again, the trail descends down to the familiar Budhi Gandaki we reach the majestic Larkya Glacier. The journey takes us towards Salla Khola before finally heading out of the valley and reaching Dharmasala for the night. Today is the day we cross the Larkya La pass (5160m), widely known as perhaps the most dramatic adorning the Himalayas? 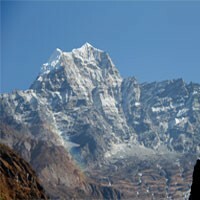 A long day of travel boasting dazzling views the world's largest Himalayas. The journey begins with a steep ascent towards the northern end of the Larkya Glacier. With the rising altitude, the trail gets steeper and steeper before finally giving way to Larkya La Pass at 5,160m and the views do not hold back. The sight of Mt. Manaslu (8,163m), Samdo (6,335m), Ngadi Chuli (7,871m) and countless peaks stretching over 6500m is something beyond words could describe. We descend to Bhimthang for the night. The long way back home begins today as we continue our descent from Bimthang towards Tilije. For the final few times, we once again descend to Budhi Gandaki heading towards Sangure Kharka beyond which the picturesque hamlet of Kharka awaits. The final stretch of the journey takes us past terraced farmlands and towards Gho beyond which lies Tilije. Overnight stay at Tilije. Today, we head towards Chyamche which falls under Annapurna Conservation Area. The trail winds up towards the stony ridges adorned by the Mani stones and seas of prayer flags and towards Thonje. Taking mental notes in awe of the local way of life we continue our journey to reach Dharapani. The trail winds towards the Marshyangdi River before reaching Tal beyond which a steep descends takes us to Chyamche. Overnight stay at Chyamche. The final day of the Manaslu circuit Trek today; we descend to the trailhead at Bhulbhule. The journey begins alongside the banks of raging Marshyangdi through lush green forests filled with oak, juniper and Sal trees. Enjoying the pleasant landscapes surrounding us, we head towards Bahundanda. As the valley closes behind us, we cross the quaint hamlet of Lampata before reaching Bhulbhule. Overnight stay at Bhulbhule. Day 16 : Drive back to Kathmandu. Fare well dinner with Frolic Adventure. The final day of the Manaslu Circuit trekking; we head back to Kathmandu from Bhulbhule crossing the hustling and bustling town of Besisahar on our way. The journey begins on the familiar bends of Prithvi Highway surrounded be pleasant landscapes before for the final time Trishuli River joins us. A grand farewell dinner with Frolic Adventure awaits us as we head back to our hotel. Overnight stay at a hotel in Kathmandu. The final day of the 17 days Manaslu Circuit Trek and the curtain on our Himalayan adventure comes to a close. You will once again drive back to Tribhuvan International Airport for your flight back home. Best Wishes on your next adventure and we pray we too will be a part of it.